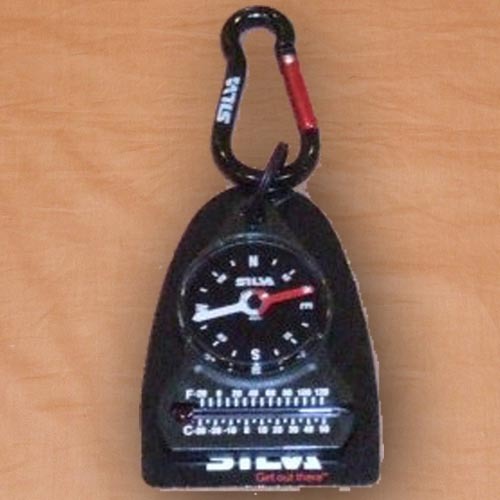 Carabiner Series compass by Silva of Sweden. The highly popular carabiner series is made for general outdoors and travelling use and packs a small, lightweight, basic directional compass together with a carabiner for quick attachment to bags and rucksacks. Each compass in the carabiner series has one extra function, making it the perfect traveller's companion. Carabiner compass with Thermometer: 31mm diameter directional compass with quality Swedish steel needle, with red north, mounted on super-smooth bearing for superior reliability Miniature thermometer graduated in Fahrenheit and Centigrade with a range of -30 to 50 degrees Centigrade.